The Chevening Secretariat is accepting applications for 2016/2017 Chevening Scholarships via www.chevening.org/apply from 3 August until 3 November 2015. There are approximately 1,500 Chevening Awards on offer for the 2016/2017 academic cycle. These scholarships represent a significant investment from the UK Government to develop the next cohort of global leaders. • Be a citizen of a Chevening-eligible country, and intend to return there for a minimum of two years after your Chevening Award has finished. • Have an undergraduate degree that will enable you to gain entry to a post-graduate programme ar a UK university. • Have completed at least two years' work experience before applying. This can include voluntary work and paid or unpaid internships. • Provide two reference letters in English while submitting the application. • Apply to three different eligible UK university courses (unless otherwise specified in your award category) and receive at least one unconditional offer for one of the three courses by 14 July 2016. 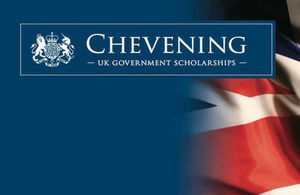 Make sure you read the information on http://www.chevening.org/belarus/ and the Chevening Programme terms and conditions. • Education and Youth Organisations Management and Governance.